Mean hypertension knowledge scores according to functional health literacy level. Asterisks indicate 95% confidence interval; scores ranged from 3 to 21 of 21 possible questions. Mean diabetes knowledge scores according to patients' functional health literacy. Asterisks indicate 95% confidence interval; scores ranged from 1 to 10 of 10 possible questions. Background Inadequate functional health literacy is common, but its impact on patients with chronic diseases is not well described. Objective To examine among patients with hypertension or diabetes the relationship between their functional health literacy level and their knowledge of their chronic disease and treatment. Methods We conducted a cross-sectional survey of patients with hypertension and diabetes presenting to the general medicine clinics at 2 urban public hospitals. Literacy was measured by the Test of Functional Health Literacy in Adults. Knowledge of their illness was assessed in patients with diabetes or hypertension using 21 hypertension and 10 diabetes questions based on key elements in educational materials used in our clinics. Results A total of 402 patients with hypertension and 114 patients with diabetes were enrolled. Mean (±SD) knowledge scores for patients with hypertension with inadequate (n=189), marginal (n=49), or adequate (n=155) literacy were 13.2±3.1, 15.3±2.2, and 16.5±2.3, respectively (range, 4-20; P<.001). A total of 92% of patients with hypertension and adequate literacy levels knew that a blood pressure reading of 160/100 mm Hg was high compared with 55% of those in the lowest reading level (P<.001). Mean (±SD) knowledge scores for patients with diabetes with inadequate (n=50), marginal (n=13), or adequate (n=51) literacy were 5.8±2.1, 6.8±1.9, and 8.1±1.6, respectively (range, 1-10; P<.001). A total of 94% of patients with diabetes and adequate functional health literacy knew the symptoms of hypoglycemia compared with 50% of those with inadequate literacy (P<.001). Conclusions Inadequate functional health literacy poses a major barrier to educating patients with chronic diseases, and current efforts to overcome this appear unsuccessful. This problem may be more common than many health care providers realize; reading skills are deficient in 46% to 51% of adult US citizens according to the National Adult Literacy Survey.12 We previously documented that 35.1% of English-speaking patients and 61.7% of Spanish-speaking patients seeking care at2 public hospitals lack literacy skills adequate to function in the health care settings.13 We and others showed that lower literacy skills also correlate with poorer self-reported health status.14,15 Because of their worse health, patients with poor literacy skills are likely to have even greater educational needs. However, the impact of literacy on patients' knowledge of their own illnesses and self-management skills has not been elucidated. To examine the relationship between literacy and knowledge of chronic disease, we focused on patients with hypertension and diabetes. In addition to being prevalent, these chronic diseases require daily attention to self-care and have standard markers of disease control (levels of hemoglobin [Hb] A1c and blood pressure). In this study we measured the functional health literacy of patients with diabetes or hypertension and evaluated the relationship of patients' literacy levels to knowledge of their chronic disease and markers of disease control. Understanding the role of functional health literacy in disease management and patient education should enhance efforts to improve patients' knowledge of their disease and adherence to treatment plans. This study was conducted at 2 urban public hospitals. Harbor-UCLA Medical Center is a 500-bed public hospital in Torrance, Calif, operated by the Los Angeles County Department of Health Services. The hospital serves an extremely diverse patient population; approximately 40% are Latino, 30% black, 25% white, and 5% other ethnic minorities. Grady Memorial Hospital is an approximately 900-bed public hospital in Atlanta, Ga. The vast majority of its patients are black indigent residents of Fulton and DeKalb Counties. The study design, contact, and consent forms were approved by the human investigations committees at both institutions. Patients were enrolled during a 3-month period from June 1994 through August 1994. All research assistants underwent 15 hours of training explaining the rationale and study design, interviewing techniques, and procedures for knowledge and functional health literacy test administration. A project coordinator conducted ongoing quality control of the research assistants. At Harbor-UCLA Medical Center, all patients with hypertension or diabetes presenting to the General Medicine Clinic on weekdays during regular appointment hours were eligible if they were currently being treated with daily medication. Patients were identified by review of their medical chart and the diagnosis was confirmed with the nurse in the clinic. Patients with both type 1 and type 2 diabetes were included in the study; the vast majority had type 2. Exclusion criteria were prior enrollment in this study or other literacy studies, age younger than 18 years, unintelligible speech, overt psychiatric illness, lack of cooperation, police custody, and being too ill to participate. Patients were recruited after they had been registered into the clinic and were waiting to see a physician. To diminish selection bias, eligible patients were enrolled sequentially from the medical charts of patients waiting to be seen. After obtaining informed consent, we collected information about demographics and self-reported reading difficulties. Patients' functional health literacy was then measured with the Test of Functional Health Literacy in Adults (TOFHLA), an instrument that assesses the ability to perform basic reading and numerical tasks required of patients in the health care setting (eg, reading prescription bottles, appointment slips, and instructions for diagnostic tests).16 A 50-item reading comprehension section and 17-item numeracy section compose the TOFHLA. The reading comprehension section uses the modified Cloze procedure; every fifth to seventh word in a passage is omitted and 4 multiple-choice options are provided. This section measures the ability of patients to read and understand prose passages selected from instructions for preparation for an upper gastrointestinal tract radiograph series, the patient "Rights and Responsibilities" section of a Medicaid application, and a standard hospital informed consent document. Readability levels of these passages on the Gunning-Fog index are grades 4.3, 10.4, and 19.5, respectively. The numeracy section tests the ability of patients to comprehend labeled prescription vials, results of blood glucose tests, clinic appointment slips, and financial assistance information. The numeracy score is multiplied by a constant of 2.941 to create a score from 0 to 50, the same as reading comprehension, yielding a total TOFHLA score of 0 to 100. Approximately 3 days after the initial interview, patients were contacted by telephone and interviewed to administer the appropriate test of knowledge of disease. Interviews were conducted in the patients' native language (English or Spanish). Blood pressure readings were abstracted from the medical record of the visit on the day of study entry. The most proximate measurement of HbA1c was recorded from the computerized laboratory record. 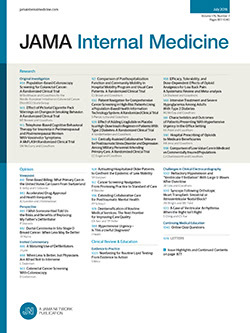 Methods were similar in Atlanta but with 3 exceptions: (1) patients who spoke English as a second language were excluded, (2) only patients with hypertension were enrolled because most patients with diabetes were followed up in a separate clinic, and (3) patients were interviewed immediately after the physician visit because previous experience indicated follow-up via telephone would not be as successful. Presence of hypertension was determined by patient self-report and review of the medical chart with confirmation by the clinic nurse. Patients with hypertension in Atlanta and Los Angeles were combined for analyses. Categorical variables were analyzed using unadjusted χ2 tests. Differences in age and hypertension knowledge scores were analyzed using 1-way analysis of variance. Because of the skewed distribution of scores for diabetes knowledge, differences were analyzed using the Kruskal-Wallis test. To adjust for confounding factors that could affect hypertension knowledge (eg, duration of hypertension), we used multiple linear regression. For diabetes knowledge, we created a dichotomous variable of "low diabetes knowledge" using a cutoff point of 5 correct answers or less of 10, and used this as the dependent variable in multivariate logistic regression. Two dummy variables for literacy were created, "marginal" (0/1) and "inadequate" (0/1), and patients with adequate literacy were used as the reference group. A final P=.05 for any variable or for any group of categorical variables was used to determine statistical significance in the models. Interactions between significant variables were also assessed, although none were significant. Data analyses were performed using Stata18 and SAS19 statistical software programs. In Los Angeles, 488 patients were screened and 386 were eligible for the study. A total of 8 patients refused to participate, 14 were called to see the physician before completing the interview, and 364 (94% of eligible) completed the interview. In Atlanta, 284 patients were screened and 250 were eligible for the study. A total of 8 patients refused to participate in the initial interview, 26 could not be located or declined to complete the exit interview, and 216 completed both the initial and exit interviews (86% of eligible). Of these, 8 patients reported that they did not have high blood pressure but had a diagnosis of hypertension in their medical record and took antihypertension medications. More than two thirds (69%) of Spanish-speaking patients and 22% of English-speaking patients in Los Angeles and 57% of patients in Atlanta had inadequate functional health literacy. Characteristics of patients with hypertension and diabetes are presented according to literacy level in Table 1. Patients with marginal and inadequate literacy were older than patients with adequate literacy, among both patients with hypertension and diabetes (P<.001). The majority of participants were female and black or Latino, reflecting the populations seen in the clinics. Patients with lower literacy levels had completed fewer years of schooling. Spanish-speaking patients had poorer functional health literacy than English-speaking patients among both patients with hypertension or diabetes, even though the TOFHLA was administered in Spanish. Patients' functional health literacy strongly correlated with knowledge of their illness. Table 2 shows examples of questions asked of patients with hypertension and proportions answering correctly according to level of functional health literacy. Patients with poor literacy skills were less likely to answer these knowledge questions correctly than literate patients. For example, only 42% of patients with inadequate literacy knew that a blood pressure reading of 130/80 mm Hg was normal, and 45% did not know that a blood pressure reading of 160/100 mm Hg was high. High proportions of patients with inadequate functional health literacy also lacked knowledge about the effect of lifestyle and dietary factors on blood pressure. One third of patients with inadequate literacy did not know that losing weight lowers blood pressure, more than one third did not know that canned vegetables are high in salt, and 60% did not know that exercise lowers blood pressure. Among all patients with hypertension, mean scores of knowledge (range, 0-21) were strongly related to literacy (Figure 1). Patients with adequate functional health literacy had a mean (±SD) score of 16.5± 2.3, while the mean (±SD) scores for patients with marginal and inadequate literacy were 15.2± 2.2 and 13.2± 3.1, respectively, (P<.001). The majority of patients with the poorest knowledge of their disease had inadequate literacy skills. Of 59 patients who correctly answered 11 or fewer questions, 52 (88%) had inadequate functional health literacy. In addition to literacy, duration of hypertension (P<.001), years of school completed (P<.01), and age (P<.01) were significantly associated with hypertension knowledge scores in univariate analysis. After adjusting for these factors, patient reading ability remained the strongest predictor of hypertension knowledge; the adjusted difference between patients with adequate and inadequate literacy was 1.9 (95% confidence interval, 1.2-2.6). A total of 73% of the patients with diabetes in this study had attended diabetes education classes (mean [±SD] number of classes, 5.8±7.0; median, 4). There was no relationship between literacy and the number of diabetes classes attended. Despite this, patients with diabetes and inadequate functional health literacy had significantly less knowledge of their disease. Sample questions of diabetes knowledge and the proportion of patients answering items correctly are shown in Table 3 according to functional health literacy. For example, literate patients were significantly more likely to know the symptoms associated with hypoglycemia and the proper treatment for it than patients with inadequate functional health literacy. Only 50% of patients with inadequate literacy knew that feeling shaky, sweaty, and hungry meant one's blood glucose level was low, compared with 94% of patients with diabetes with adequate functional health literacy (P<.001). Only 38% of low-literate patients knew the proper treatment for such symptoms compared with 73% of literate patients. Mean scores of diabetes knowledge among patients with diabetes were directly correlated with literacy level (Figure 2). On the 10-question diabetes knowledge assessment test, patients with adequate functional health literacy had a mean (±SD) score of 8.1±1.6 while the mean (±SD) scores for patients with marginal and inadequate literacy were 7.1± 2.0 and 5.8±2.1, respectively (P<.001). Higher mean score of diabetes knowledge was also associated in univariate analysis with younger age (P=.04), more years of schooling (P<.001), and previous attendance in diabetes education classes (P=.02), but not the number of classes attended nor the number of years of having diabetes. However, in a multivariate analysis, literacy level was the only variable significantly associated with low score of diabetes knowledge (≤5 answers correct; odds ratio, 4.5). Changing the cutoff point for low score of diabetes knowledge to 6 or 7 did not change the results of the regression analysis. Despite the consistent association of less knowledge of one's illness with lower functional health literacy levels, measures of outcome (blood pressure or HbA1c level) were not significantly associated with literacy. Low-literate patients with hypertension had higher systolic blood pressures (155 mm Hg vs 147 mm Hg, P=.04) than patients with adequate literacy. However, after adjusting for age, a nonsignificant 6 mm Hg difference remained (P=.12). No association was found between literacy level and diastolic blood pressure (P=.79). A total of 55 patients had a HbA1c level recorded in the electronic laboratory records. Although a trend of worse blood glucose control with worse literacy level was noted, the differences between patients with inadequate and adequate functional health literacy on blood glucose levels (11.7 mmol/L [212 mg/dL] vs 10.9 mmol/L [197 mg/dL], P=.27) or hemoglobin A1c levels (8.3% vs 7.5%, P=.16) were not significant. Many reports have emphasized that patients' literacy skills must be considered in the care and education of patients with chronic diseases such as hypertension or diabetes.20-24 However, this is the first study, to our knowledge, to measure the functional health literacy skills of patients with a chronic disease and evaluate the relationship of literacy to patients' knowledge of disease and self-management skills, and outcomes. Almost half (48%) of the patients with hypertension or diabetes in this study had inadequate functional health literacy, and these patients had significantly less knowledge of their disease, important lifestyle modifications, and essential self-management skills (Table 1, Table 2 and Table 3). The fact that patients with diabetes with inadequate literacy had lower scores on knowledge despite having attended formal education classes clearly shows that current educational strategies do not reach the large number of patients with poor reading skills. Despite the strong correlation between inadequate literacy skills and worse disease knowledge, we did not find a significant relationship between literacy and disease outcomes. Patients with hypertension and inadequate functional health literacy had higher systolic blood pressure readings than literate patients, and patients with diabetes and inadequate literacy had higher HbA1c levels, but the differences were P=.12 and P=.16, respectively. This may have been due to our small sample sizes. With our sample size of 352 patients with hypertension, we had a 65% chance, or power, of detecting a 6–mm Hg difference in systolic blood pressure between patients with inadequate and adequate literacy. With our sample size of 55 patients with diabetes with measured HbA1c, we had a 33% chance of detecting a 1-point difference in HbA1c levels between those with adequate vs inadequate literacy. Our finding of a lack of significant correlation between literacy and disease outcome may also be because we only looked at 2 potential outcome parameters, although other studies have also shown knowledge to be only weakly or not at all associated with disease outcomes or adherence.11,25,26 Other factors, such as patients' health beliefs and their locus of control, may also affect adherence and disease outcomes.27 Inadequate knowledge of the effect of diet and weight on blood pressure certainly may contribute to poorer control of blood pressure, and lack of knowledge of the symptoms of hypoglycemia and its treatment may be life-threatening. Half of the patients with diabetes and inadequate literacy in this study did not recognize that feeling shaky, sweaty, and hungry meant one's blood glucose level was low, and 62% did not know the proper treatment. However, we did not find a strong correlation between knowledge of disease and the 2 outcomes we measured. Nevertheless, knowledge remains an important goal of patient education programs and our results show that many patients with inadequate functional health literacy, even those who have attended formal diabetes education programs, did not know the basics of their disease and self-management skills. Other studies support the importance of improving patients' knowledge through education and the associated benefits of improving compliance with health care appointments and medications for patients with hypertension28,29 and diabetes.30-32 Improving adherence to medical advice is an important goal of education programs; the Medical Outcomes Study showed that compliance correlated with improved outcomes in patients with diabetes and hypertension.33 Previous research at Grady Memorial Hospital34 showed that in addition to access barriers, limited self-care skills in management of diabetes was one of the primary causes of diabetic ketoacidosis. There are several potential limitations to our study. First, patients with higher functional health literacy may not be more knowledgeable, but simply better at taking tests than low-literate patients. We attempted to overcome this by administering the test orally, but direct assessment of disease management skills may be more valid. Second, we do not know the generalizability of our findings. Yet inadequate literacy pervades our society,12 especially among the elderly population, and must be considered in patient education.35 Finally, sample size may have prevented detection of a significant link between patients' literacy skills and the outcomes of blood pressure and HbA1c values in this exploratory study. Larger studies are necessary to explore the linkages between patients' literacy skills and health outcomes. The problem of educating low-literate patients cannot be ignored. The Joint Commission on Accreditation of Health Care Organizations43 mandated that hospitals and other health organizations provide instruction understandable to patients, assess patients' knowledge, and document such educational efforts. Additionally, Healthy People 200044 set goals of having at least 90% of patients with hypertension take action to control their blood pressure, and of having 75% of people with diabetes receive education on diabetes. Patients' functional health literacy must be considered when attempting to reach these goals. However, no simple method of identifying low-literate patients exists, and the significant shame associated with illiteracy often makes them hide their disability.45 Direct involvement of patients in developing educational materials may empower them to improve their health while ensuring that the content effectively educates them.4,46 The future of patient education requires ingenuity and commitment of necessary resources to improve outcomes for low-literate patients with chronic diseases. Accepted for publication April 23, 1997. This work was supported by a grant from the Robert Wood Johnson Foundation, Princeton, NJ. We express our sincere thanks to Ron Hall, MA, project coordinator, Nina Parikh, MPH, assistant project coordinator, and Danni Daniels, MS, for statistical assistance. Copies of the TOFHLA may be obtained by contacting Joanne R. Nurss, PhD, Center for the Study of Adult Literacy, Georgia State University, University Plaza, Atlanta, GA 30303. Reprints: Mark V. Williams, MD, Department of Medicine, Emory University School of Medicine, 69 Butler St SE, Atlanta, GA 30303 (e-mail: mwillia@emory.edu).